Here is a play that I first encountered and enjoyed thirty years ago when it was produced by the American Jewish Theatre. A musical version that kept the essentials of the story opened Off Broadway in 2004. It too was fine. However, it is the non-musical version that is effectively unfolding on the stage of the George Street Playhouse. The Immigrant might easily be called a mini epic of the old West as it focuses on the first Jewish settlers who came to Hamilton County, Texas. Mark Harelik's play specifically pays homage to the memory of his grandfather, one of the many immigrants who, victims of the early 20th century pogroms in eastern Europe, came to America. With a cast of only four called upon to fill up the spaces of a tiny Texas agricultural community (imaginatively evoked by designer Jason Simms), this well written play has been sensitively directed by Jim Jack. It's a tender and enjoyable saga that embraces a personal chronicle spanning eighty years beginning in 1909. 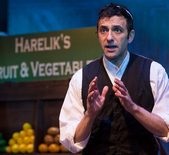 At the play's center is Haskell Harelik (Benjamin Pelteson), a Russian Jew who has migrated from his Shtetl in 1909 to this decidedly Southern Baptist terrain where he begins the next phase of his life selling bananas for a penny a piece. Despite his prayer shawl and old world mannerisms, he embodies the eager immigrant who is offered a bright future. Harelik unexpected business partner Milton Perry (R. Ward Duffy) is a crusty but shrewd local banker who has opened up his home and his bank's loan department to the immigrant. While Milton's largesse is principally confined to the economics of the venture, his open-hearted wife Ima (Gretchen Hall) is largely responsible for the life-long relationship that follows. Just so you know, Ima is as sweet as the apple pies she bakes. In one of the play's many beautifully dramatized incidents, Ima shares her feelings with Leah (Lauriel Friedman), Haskell's lovely but shy newly arrived wife. Leah's own feelings about life in a decidedly non-kosher Texas triggers her initial insecurities. Tied together by a compelling narrative, the incidents depicted are both substantive and disarming. Much of the play's richness derives from the cultural differences between the Jews and Christians: the religious rituals and the philosophical issues that arise over the years. It's a story that resonates today. The play is set at a time when the immigration of refugees had clearly become an issue for America . However, a way was found to take some of the burden away from the port of New York by diverting immigrants to the port in Galveston, Texas. Despite a first act that may appear as a bit too schmaltzy, by the secon act we are completely committed to seeing how Haskell goes from selling produce from a pushcart to being the owner of a successful department store. Much pleasure is derived from seeing Haskell and Leah's joy having raised three sons, all of whom grow up to fight as American citizens in World War II. It is curious, however, that World War I and the Great Depression are not part of the narrative. On the lighter side, we have the very amusing initial language barrier that will eventually make everyone a bit wiser. The winning combination of tears and laughter is hard to beat. The colorfully expressed Yiddishisms and Southern-American old wives superstitions become part of a cross cultural sharing even though the Yiddishisms that are adopted by Ima are a bit mangled. Seeing its characters change and grow is a major strength of the play. Kelteson is standout as the unwavering orthodox Harelik. It is a treat to watch Friedman evolve from the once fearful Leah, concerned about being the only Jews in the town, into a secure mother and a modern wife. Also commendable is Duffy's stiff-necked posturing as the self sufficient and notably isolationist Milton. His complicated friendship with Harelik is often tested with explosive results. We are also enamored by Hall's winning performance as the almost twittering-with-goodness Ima. The spirit of the playwright is as evident as is the commitment of the performers and their director to make this play a paean to the eternal optimism of the assimilating immigrant— and the willingness of American communities to welcome a stranger.